Friday Wrap-Up – Burgers n’ Beer Events Planned for NB, Brews and News from Garrison, Propeller, Sea Level, Rockbottom, Bad Apple Brewhouse, and more! • Despite just wrapping up the 2014 Fredericton Craft Beer Festival earlier this month, organizer Lloyd Chambers is bringing another beer idea of his to fruition… Burgers n’ Beer! Partnering with reLiSH Gourmet Burgers, there will be three small events throughout New Brunswick. The first will be held on Tuesday, April 15th in Fredericton from 8-10 pm (at the new uptown location), and will include six reLiSH sliders paired with six 8 oz pours of craft beer and cider. The tentative brewery list includes Grimross Brewing, Red Rover, B.C.’s Central City Brewing (with their Red Racer IPA representing), and Celtic Knot and Hammond River Brewing, both in Fredericton for the first time for this event! A custom 8 oz tasting glass is also included, and Adam Clawson of Red Rover will be doing a small presentation on all three of his ciders pouring at the event. Tickets are $45, taxes and fees included, and can be purchased online here. Future events are also planned for reLiSH locations in Moncton (April 29th) and Saint John (tentatively May 9th). 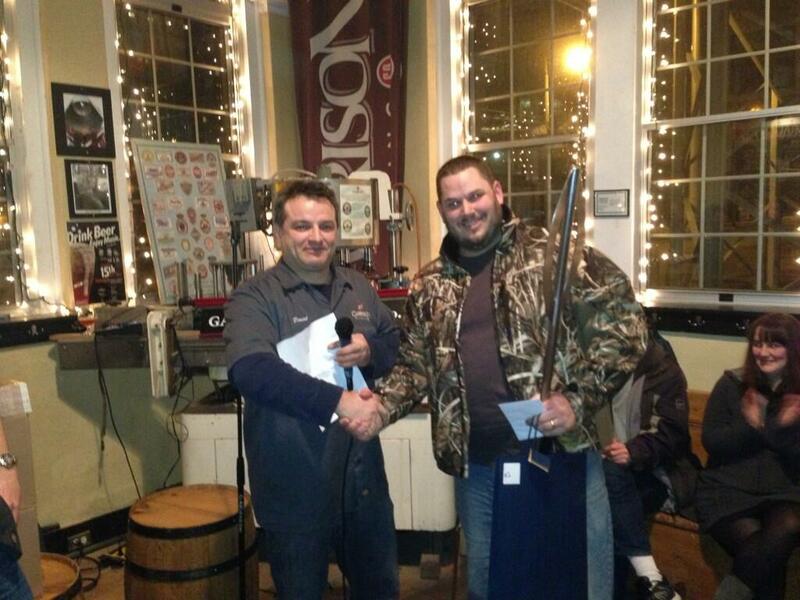 • Garrison Brewing has just released last year’s Garrison Home Brew-Off winner. Saint Peter’s Belgian-Style Strong Ale, a Belgian Blond Ale, was brewed with the winner of 2013’s competition, homebrewer Peter Welton. Coming in at 7.5% ABV and 24 IBUs, the beer is described as having a “hazy but vibrant orange color and a fluffy white head”, and exhibits a “smooth, spicy, and fresh aroma with notes of vanilla and banana, with the juicy flavor matching the aroma and finishing with a lingering warmth”. Look for the beer in bottles at the Garrison retail store, and at private liquor stores and NSLC stores throughout the province. • Returning this week from Propeller Brewing is their popular Double IPA. A “heavily dry-hopped” Imperial IPA, it packs a punch at 8.2% ABV, with 85 IBUs. The brewery describes the beer as having “a huge amount of piney, floral, and citrusy hop aroma and flavors, balanced by sweet malt flavors”. You can find the beer in bottles and growlers at the Halifax and Dartmouth Prop Shop locations, and in bottles only at NSLC and private liquor stores in the province. • Hot off the recent release of their El Rojo Diable Double IPA (which is just about gone, by the way), Sea Level Brewing is releasing another new beer. New World Alt is a Düsseldorf Altbier brewed from a recipe given to Brewmaster Randy Lawrence from a brewer friend of his in Düsseldorf, Germany. Described as a “clean, medium-bodied ale” with a background hop presence provided by the Hersbrucker hop, the beer is lagered for three weeks at zero degrees before packaging; it comes in at a very drinkable 4.8% ABV. New World Alt should be available at the brewery sometime next week, and will follow shortly afterwards at their regular outlets. • The Rockbottom Brewpub in Halifax recently provided details on their next beer dinner on their Brewer’s Blog. Starting at 6 pm on Monday, March 31st, the three-course meal looks spectacular as usual, and features beers from brewer Greg Nash that includes Balticus, Fathom IPA, and Wreckoning RIS. Tickets are $35 and can be reserved by calling the brewpub. • Meanwhile at Rockbottom, Nash has released some early details on two new beers that he’s brewed recently. The first is a Double IPA that is fermented with “Conan”, a well-known yeast strain in the brewing world as it is the one used by The Alchemist brewery in Vermont in their world-famous Heady Topper DIPA. The original yeast was cultured from a can of Heady Topper by one of the members of the Brewnosers, and Nash continued to grow this yeast until he had enough for a full-sized batch. Dry-hopped multiple times, the beer’s ABV will come in around 8% with 130 IBUs (calculated). The other beer is a SMaSH (single malt and single hop) India Pale Lager. Brewed with Pale Ale malt and Galaxy hops, the beer is fermented on lager yeast at cool temps, and then lagered and dry-hopped with more Galaxy. Look for this one to finish somewhere between 6.5-7% ABV, and with 80 IBUs. Both beers should be available at the brewpub sometime in the near future! • Details are still very slim, but we can report that Bad Apple Brewhouse has brewed a new DIPA. Supposedly bigger and hoppier than the crowd-pleasing Conception DIPA that was pouring at the FCBF this month, this should be one heck of a beer! Stay tuned for more details as the beer approaches completion/packaging. • The PEI Brewing Co. has started a new “Cask Program” run by brewer Karen Allen. We’ll have some more details in the near future, but for now they’re sending three pin casks to Halifax early next week to be tapped at Stillwell sometime soon. The first cask, Cherry Blaster, is the same sour, barrelled Saison that’s been served before, but instead of dry-hopping this one, they’ve added a tart cherry concentrate. The second cask is Business Lunch IPA, a “sessionable pale ale” dry-hopped with Mosaic and Cascade. Finally, Spray Tan Imperial IPA is a DIPA that has been double dry-hopped; first with Cascade and Falconer’s Flight, and then with Centennial in the cask. Keep up-to-date with Stillwell’s tap list on their Twitter feed. • And a reminder that the 2014 Saint John Beer Fest is fast approaching! This year’s event is once again being held at the Market Square Atrium in downtown Saint John, on Saturday, April 5th. It was just reported this morning that all tickets are now sold out (including regular admission and VIP). The brewery/beer list has recently been posted on their Facebook page linked above. We hope to have a more detailed post on the festival sometime next week! Another full week of Atlantic Canadian Beer News, and we’ll focus on the Garrison Brewing Home Brew-Off, whose results were announced last night at a great gala. 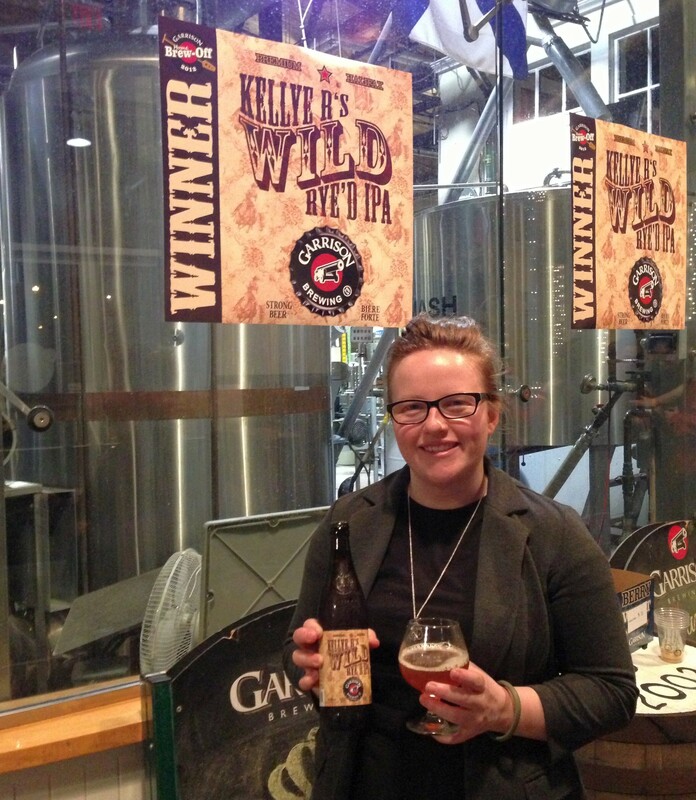 Last year’s Brew-Off winner, Kellye Robertson, was in attendance to help launch “Kellye R’s Wild Rye’d IPA”. The beer was on tap, and the double-dose of Citra she and Brewmaster Daniel Girard used really comes through, and it’s great! I can see this beer selling out quickly, so be sure to pick it up soon, where better beer is sold. Brian Titus also announced that after she finishes her diploma at the Niagara College in the Brewmaster and Brewery Operations Management program, she will be returning to work at Garrison. Welcome aboard! Daniel spoke about the challenges of scoring and picking winners from 69 entries. They had to change their plan this year to taste and evaluate the beer in groups of 8, with several folks helping to whittle it down to a final four. The final four were judged the day of the gala, by three BJCP-certified judges, and from them, the winner was chosen. And the winner is… Peter Welton! The judges loved the carbonation level and clarity of his beer, and thought it was a great example of the Belgian Blonde style. Peter will be brewing his beer with Daniel in the spring. Congratulations, Peter! Also congratulations to Andrew, Gerald and Dewi for top four finishes. We were fortunate to try all of the beer, and they were all great. Well done! 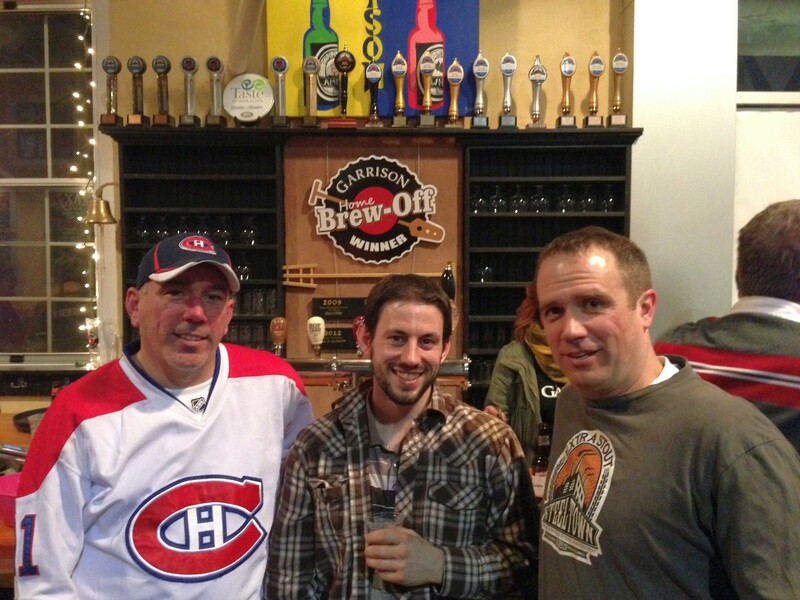 I was also lucky enough to snap a picture of the 3 previous Brew-Off Winners in front of the trophy now on display at Garrison (only 4 years late). Brian Harvey (2009, Harvey’s Bitter), Adam Comeau (2011, Adam Und Eric’s Neuschottland Schwarz Black Lager), Scott Tilford (2010, Nit-Wit Belgian Wit). In other important news, next year’s Home Brew-Off style was announced (after much poking and torturing of Mr. Titus), and it is BJCP Style 15A: Weizen/Weissbier. So start your kettles now, homebrewers! This is one of my favourite styles of beer, so I’m looking forward to brewing up a few test batches to perfect a recipe for submission. 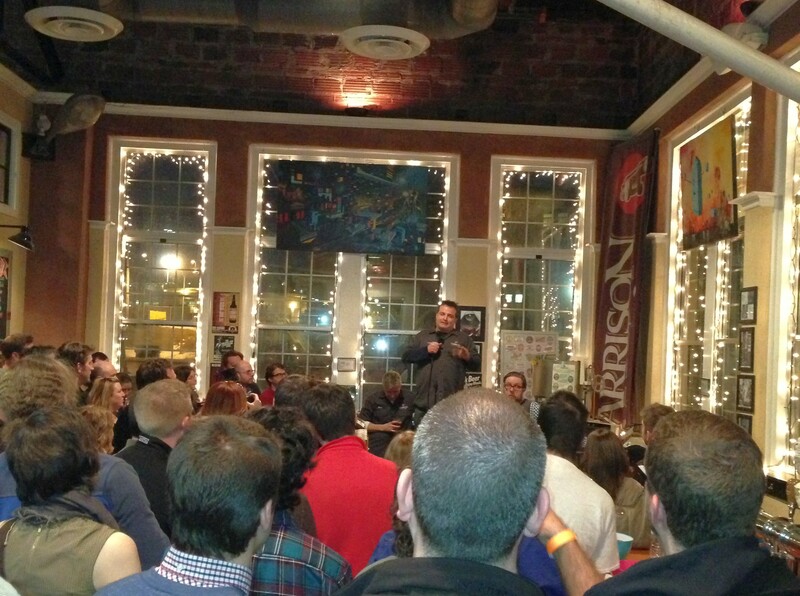 In other Garrison news, their next One Hop beer will be released soon, and it will be showcasing the Citra hop. I’ve got word that there might be more than one batch of this made, which means we won’t run into a sold-out situation like we did with the Comet release. As I mentioned above, I’m a big fan of Citra, so I can’t wait!